Upcoming renovation of the historic Immaculate Conception Church and adjacent Link Building into 63 rental residences. Select residences will have patio spaces, balconies, and roof terraces. Resident common space will also be located on site. Six apartments at The Cosmopolitan will be designated affordable. 45 resident parking spaces will be reserved in the adjacent James Court garage. The buildings’ historic facades will be fully restored and preserved, and original details including arches and stained glass windows will be preserved within residences and integrated with modern finishes. For more information on The Cosmopolitan contact The Piracini Group at 781.475.2475. The Piracini Group has been named the exclusive listing agent for The Cosmopolitan in Boston’s South End. This exciting new development is transforming the Immaculate Conception Church and neighboring Link Building into 63 luxurious residences, available for rent. The development will bring modern interior finishes to the classic building while maintaining the historic facade and many of the church's original details including arches and stained glass windows. Many residences will offer private balconies, and there is garage parking available within the same block at an additional monthly fee. Building amenities will include a 24-hour concierge, fitness center, resident lounge, pet wash station, and a beautifully landscaped interior courtyard. Located along Harrison Avenue, The Cosmopolitan is easily accessible from public transportation and is just steps away from the South End’s countless amazing restaurants and locally-owned shops. Construction is set to be complete this summer. For more information on The Cosmopolitan contact The Piracini Group at 781.475.2475 or visit https://www.thepiracinigroup.com/current-project. Renovations are underway at the historic Immaculate Conception Church and Link Building in the South End. The project will convert the two buildings into 63 condo units while maintaining historical details such as stained glass windows and arches. The Harrison Ave. location is adjacent to Boston Medical center and offers easy access to the MBTA and I-93. 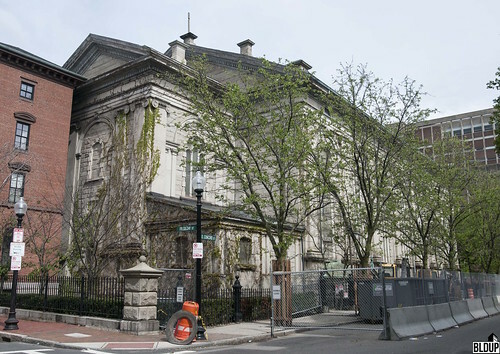 Bodwell Pines Corporation, who is converting the South End’s historic Immaculate Conception Church and adjacent Link Building into 63 residences dubbed The Cosmopolitan, proposes to offer the residences as ownership condominiums as opposed to apartments as previously planned. The proposal reflects the strong demand for condominiums in Boston and follows several projects’ recent switches from apartments to condominiums, for instance 99 Tremont Street in Brighton and 340 West Second Street in South Boston, as well as the introduction of condominiums to prominent apartment developments such as Bulfinch Crossing's Phase I residential tower. Bodwell Pines has also secured five additional parking spaces in the adjacent James Court garage, increasing the project’s total available parking spaces to 45 from 40. Bodwell Pines has filed a Notice of Project Change (NPC) formally proposing the changes to The Cosmopolitan with the Boston Planning & Development Agency (BPDA), who is now reviewing the proposal. At Thursday (November 17th, 2016)'s board meeting, the Boston Planning & Development Agency (BPDA) approved The Cosmopolitan. Located in the South End, the $9 million project will restore an existing historic church and construct 63 apartments. Developer Bodwell Pines Corporation has filed revised plans with the Boston Planning & Development Agency (BPDA) for The Cosmopolitan, a previously-approved conversion of a South End church into 63 condominiums, proposing to instead convert the church into 63 rental apartments; the following is a link to the revised plans. Following the discovery of structural insufficiencies in the existing church, a previously approved 48-car basement parking garage has been eliminated; 25 resident parking spaces would instead be reserved in the adjacent James Court garage. Bodwell Pines now proposes to construct residential units in the church's basement.